Ask nearly any founder of an early-stage software company what keeps them up at night, and there's a very good chance it'll have something to do with finding that elusive product-market fit. Developing a new product that fits the market and that customers can't wait to sign up for isn't an easy process—but with a good understanding of what product-market fit actually is and how to know when you've found it, the process becomes much easier. So what is product-market fit, anyway? And how do you find it? In a nutshell, finding product-market fit means understanding the core value hypothesis of your product—the single key element that solves a burning problem for your customers. The process of finding product-market fit involves iterating on your core value hypothesis until it resonates in your target market. Many companies make the mistake of building a product before they've found a market for it. This creates a lot of unnecessary risk for the business—the product may need significant and expensive changes to match the needs of the market, burning up precious runway and making it difficult to iterate to match customers' needs. Instead of coming up with new product ideas, then pitching them to customers, start talking to potential customers about their pain: What problems are they experiencing that you could solve? What do they complain about? Focus on the market—aka your future customers—first. By focusing on the problem first, identifying a market that really needs a solution and is willing to pay to solve the problem, then creating the product in response to the problem, you greatly increase your chances of achieving product-market fit. There's no single straight answer on how to achieve product-market fit—a fact that creates a lot of confusion and misconceptions. It's easy for new entrepreneurs to look at a thriving company and assume they reached success by following a direct path—but even the most successful software startups struggle to find product-market fit initially. Take Wealthfront, for example. Originally launched as kaChing—a social investment game hosted on Facebook that lets amateur investors try their hand at beating the market (and each other)—it took more than two years for the company to pivot and become the automated investment platform they are today. It's obvious when you've found product-market fit. 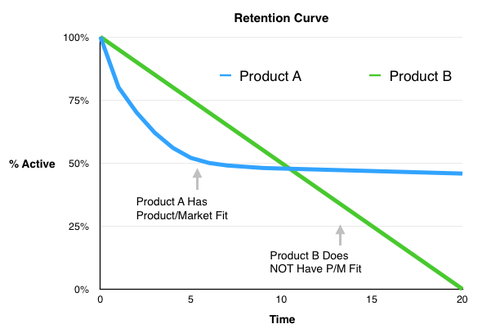 Once you've achieved product-market fit, you can't lose it. Once you've found product-market fit, you don't have to sweat the competition. Some lucky companies succeed in finding product-market fit on their first attempt. Most don't. Instead, they go through a process of trial and error—experimenting with different ideas, determining whether or not those ideas are viable, learning from their successes and mistakes, and ultimately pivoting to a stronger concept. Finding a product that fits a market can take multiple iterations over a long period of time. On the surface, kaChing and Wealthfront are very different products. But the founders' mission of making investing more accessible stayed the same—once they saw an opportunity to reach that goal much faster, they pivoted to become the product their customers needed. Product-market fit isn't a binary state. This makes it difficult for many founders to feel confident that they've achieved it. For instance, there may be multiple sub-markets within your chosen market, each of which has a different set of problems to solve and requirements to meet. It's also common that some business KPIs might indicate product-market fit, effectively masking other metrics that could indicate that the business isn't viable. Product-market fit is by no means the end of the road. It isn't a box you can check off and then never think about again. Market needs and competitors' solutions are constantly changing and evolving, and your product needs to continuously evolve to fit those market changes. Strong markets will always attract strong competitors since they offer the biggest opportunities for growth. Once you've found a value proposition that resonates with your market, you'll no doubt have competitors actively working to find their own, stronger value hypothesis—or in some cases, blatantly copying your product. Wealthfront is by no means the only automated investment platform on the market—a number of competitors have sprung up in the past few years. Wealthfront has dealt with the competition smartly—by focusing their product on the needs of their core market—passive investors with smaller accounts and less complicated financial lives—rather than trying to be all things to all users. Figuring out if you've found a product that closely fits your chosen market requires collecting both qualitative customer feedback and quantitative data, and combining this information with a healthy dose of intuition. Early adopters are normally your product's biggest fans and are the most willing to provide feedback and criticism about how you can best meet their needs. If you're still validating your initial idea and only have a handful of customers, you can reach out to them individually. Just a few calls on early on can give you critical insights into your customers' needs and how your product can be improved to provide a better solution. [Having 10 unaffiliated customers] means you built something real. Something valued. Most importantly, something you can build on. These 10 customers will give you a roadmap, feedback, and indeed, the path to 1000 more customers — if you listen carefully. Don’t take all their advice, of course, don’t get distracted from the big picture. But the feedback from these first 10 customers won’t be from outliers. It will be transformatively informative. Once you have a larger customer base—say, 100 paying customers—you can begin sending out customer surveys to determine whether you've reached product-market fit. At its most basic, a survey could consist of only one question: "How would you feel if you could no longer use our product?" If at least 40% of survey respondents answer that they would be very disappointed to lose your product, you have a strong sign of product-market fit. You can also use the opportunity to ask early customers open-ended questions about your product to gain additional insight. During the early days, when you're still trying to validate your product, your top priority is to quickly iterate on your product and positioning. So while collecting quantitative data like engagement metrics and NPS scores is helpful, the most important thing to do at this stage (and indeed, throughout your product's lifetime) is to talk to your customers. You should see organic and direct growth. Ideally at least 50% of new signups should be coming from direct or organic traffic sources. This means people are telling their friends, and those friends are signing up. You should have early users that love your product or hate it. The worst feedback you can receive about your new product is a tepid “meh,” or even no feedback at all. Tracking NPS scores with early adopters—and following up directly with detractors (scores of 0-1)—can quickly give you insights that will help you improve your product. An overall NPS score above 60 is usually a strong indicator that you've found product-market fit. “Product market fit doesn't feel like vague idle interest. It doesn't feel like a glimmer of hope from some earlier conversation. It doesn't feel like a trickle of people signing up. It really feels like everything in your business has gone totally haywire. There's a big rush of adrenaline from customers starting to adopt it and ripping it out of your hands. It feels like the market is dragging you forward. When you have a close fit between your product and the market, it it can often feel like the market is dragging you forward, rather than feeling like you're trying to wedge your product into the market. Feedback and data help to validate this feeling, but when in doubt, trust your intuition. It often take many attempts and a healthy dose of perseverance to find the core value proposition that your market wants. The best products solve their customers' problems—and the best companies are constantly improving their products to better meet the needs of the market. And sometimes, that even means pivoting from your original idea to become the product your customers truly need.